Videos, examples, and solutions to help Grade 5 students learn how to multiply unit fractions by non-unit fractions. 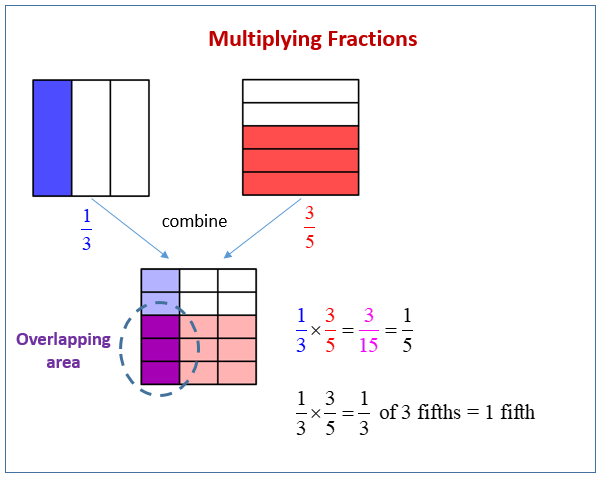 The following example show how to multiply fractions using the area model. Scroll down the page for more examples and solutions. Jan had 3/5 pan of crispy rice treats. She sent 1/3 of the treats to school. What fraction of the whole pan did she send to school? 3/4 of Benjamin's garden is planted in vegetables. Carrots are planted in 1/2 of his vegetable section of the garden. How much of Benjamin's garden is planted in carrots? Mr. Becker, the gym teacher, uses 3/5 of his kickballs in class. Half of the remaining balls are given to students for recess. What fraction of all the kickballs is given to students for recess? Jan had 3/4 pan of crispy rice treats. She sent 1/3 of the treats to school. What fraction of the whole pan did she send to school? Solve by drawing an area model and writing a multiplication sentence. Beth had 1/4 box of candy. She ate 1/2 of the candy. What fraction of the whole box does she have left? Extension: If Beth decides to refill the box, what fraction of the box would need to be refilled? 1. Solve. Draw a model to explain your thinking. 1. Solve. Draw a model to explain your thinking. Then write a number sentence. 2. 5/8 of the songs on Harrison's iPod are hip-hop. 1/3 of the remaining songs are rhythm and blues. What fraction of all the songs are rhythm and blues? Use a tape diagram to solve. 3. Three-fifths of the students in a room are girls. One-third of the girls have blond hair. One-half of the boys have brown hair. a. What fraction of all the students are girls with blond hair? b. What fraction of all the students are boys without brown hair? 4. Cody and Sam mowed the yard on Saturday. Dad told Cody to mow 1/4 of the yard. He told Sam to mow 1/3 of the remainder of the yard. Dad paid each of the boys an equal amount. Sam said, Dad, that's not fair! I had to mow one-third and Cody only mowed one-fourth! Explain to Sam the error in his thinking. Draw a picture to support your reasoning. This video shows how to multiply unit fractions by non-unit fractions using area models. It also shows how to reduce your final answer using the model. 2. Sarah has a photography blog. 3/7 of her photos are of nature. 1/4 of the rest are of her friends. What fraction of all Sarah’s photos is of her friends? Support your answer with a model. 3. At Laurita's Bakery, 3/5 of the baked goods are pies, and the rest are cakes. 1/3 of the pies are coconut. 1/6 of the cakes are angel-food. a. What fraction of all of the baked goods at Laurita's Bakery are coconut pies? b. What fraction of all of the baked goods at Laurita's Bakery are angel-food cakes?